// freko leyoo II: Wo Xi Huan "You-DONO-Who"
Heheeeeheee. Do u understand the title above? Some of u might understand, some of u might not. 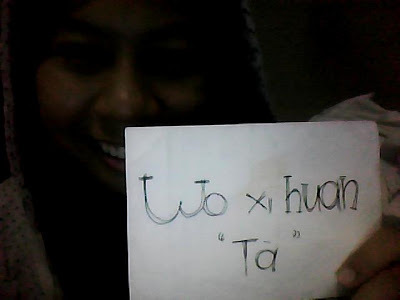 Wo Xi Huan stand for " I Like "..
Lee : Ermm.. Shen Me ming tze ? Omaigodddd, I dah panic. Salah pronounce ke ? HEHE, then I tried again . Lee : Ehemmm, Ni chiau Shen Me Ming Tze? Him : I tak tau cakap Cina. Lee : Eh, how come? U bukan chinese meh? Him : I chinese tp tak tau cakap Cina T.T . I sekolah Melayu . And I was like... dono what to say.. Happy or not. BAHHAHA. But strangeee ~ Not reallly! My sis also have a friend like him. Raised as a Cina-ren but cannot speak Cina well. Eh, you know what? Him speak sejibik macam melayu. Ok, ade loghat Cina sikit. Hehe, bt I think dia mahir la BM. Speak of him, Tak dapat nak sembang lelama wif him :'( Cuz having other customer at the back :/ HAHA, tapi segan kot bcos I was like OH-PLEASE-DONT-GO action infront the customer after him which is also a chineseeeee --"
Ngehehhh, so smpai sini jelah ! Doakan step ke-2 berjalan lancar oke? Ngeeeeeeeheeheh. Gatai ! Ehh eh, cop nak post gambo sat. HEHHE. nah !